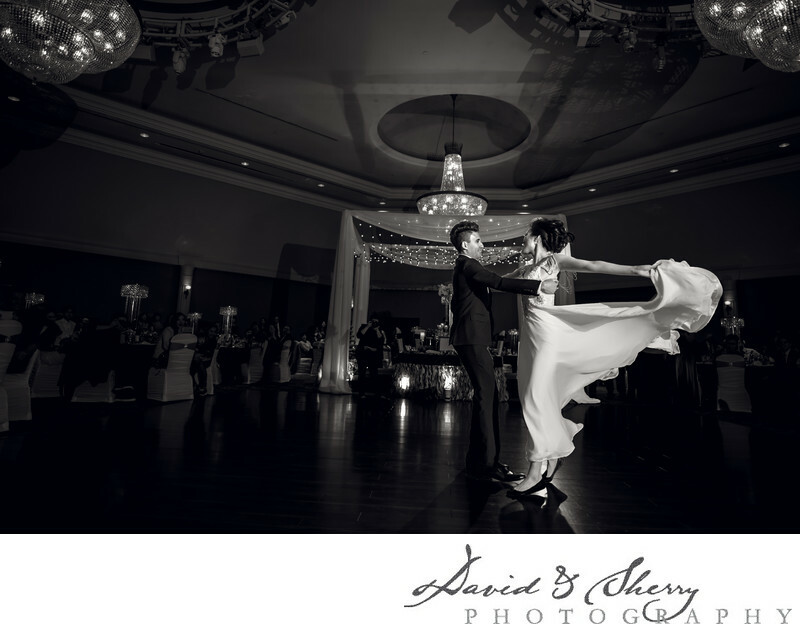 As one of the conference centres near Toronto Bellvue Manor plays host to hundreds of weddings each year. It is conveniently located along two of the major highways just north of the city making it easy for your guests to come in without hassle and without the trouble of finding parking. However even though it is a banquet centre with little decor inside the building, it can host hundreds of guests and can allow for beautiful decor to be erected inside the large rooms with which to wow the guests. This wedding took place in the springtime and the couple chose to have their head table in the centre of the room, which may not have been the choice of the coordinator, but for this pair the were able to have their choreographed first dance take place with their stunning decor of the head table in the background of the images. For this reason I think it was very much worth it. One of the funny things that happened at this wedding is that even though the father of the bride didn't speak any english he got up during one of the speeches and was yelling beautiful words in his native tongue across the dance floor to the response of tears from the guests who understood him. I may not have understood what he was saying but that doesn't mean I couldn't understand the point he was making. The love of a daughter doesn't end at the giving her away, it keeps going. It is moments like this we love to capture at each and every wedding. Location: 8083 Jane St, Vaughan, ON L4K 2M7.